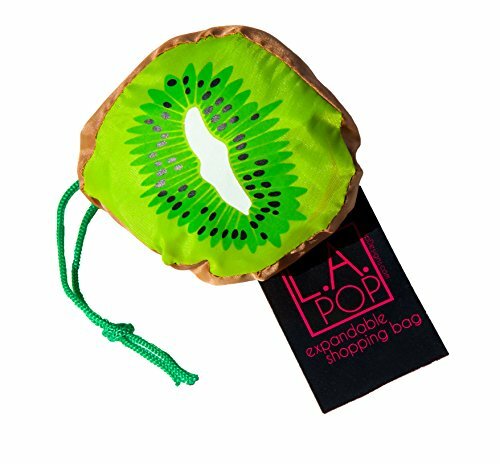 LA Pop Design Expandable Shopping Bags. Reusable Grocery Shopping Tote Bags That Are Eco-Friendly, Lightweight, Strong & Durable. Convenient Grocery Bags and Handy, Shopping Travel Bags -- 5 PACK! These colorful, fun looking, good high quality, reusable shopping bags are Eco-friendly and get the job done! Extra strong, lightweight, well sewn, nylon polyester fabric makes them the ideal reusable tote bags. Bags are 15 inches x 15 inches each, not counting the handle section of the bags. 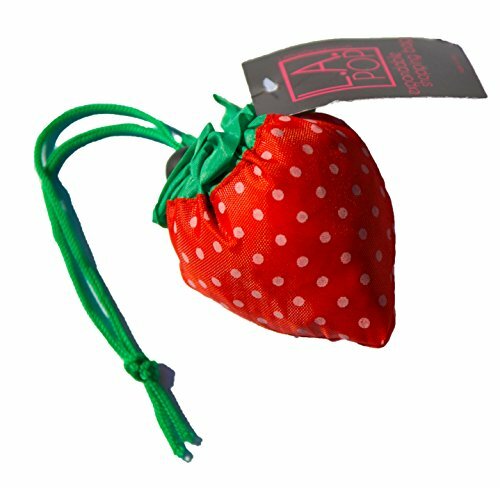 These are strong, convenient shopping / tote bags that when scrunched into the fruit and veggie storage pods only occupy about 2 or 3 inches of space. These shopping tote bags will not have that bad "off-gassing" smell that many other cheaper brands may have. Order with confidence! Your Satisfaction is 100% Guaranteed! Every order will receive a 5 PACK of a selection of bags that consists of: 5 different bags out of the 6 different colors and fruit/veggie shopping bag styles shown in the pictures above. 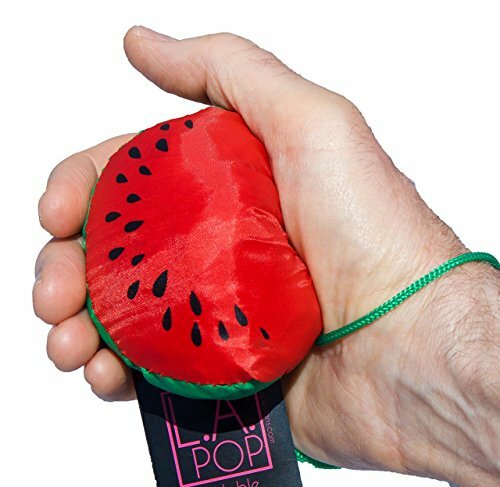 Every bag includes a handy wrist strap for easy carrying while shopping. A sliding closure tab is included to lock the bag tightly in it's pod when it's in storage and not in use. Fun, attractive colors make these shopping tote bags a great item to have for yourself and your family. Kids especially love them too! 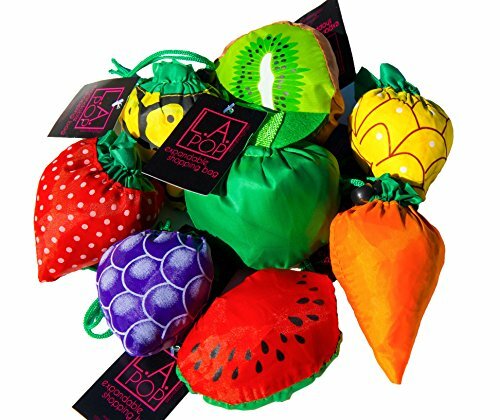 These bags can serve as a reminder for kids to eat their healthy fruits and vegetables. Buy a Package of These Fun, Attractive, Reusable Grocery Tote Shopping Bags Today and Don't Forget to Get an Extra Pack to Give as a Gift to Your Friends and/or Neighbors. Just Think! No More Boring, Ugly Shopping Bags! Supplies Are Limited! Your Satisfaction is 100% Money Back Guaranteed! Fun Colors! Attractive, High Quality Fruit and Veggie Style Shopping Bags. Kids Love Them! 5 PACK !!! - Every Order Receives a Pre-Selected Assortment of: 5 Different Bag Styles Out of the 6 Possible Fruit & Veggie Styles/Colors Shown: Lime - Grapes - Watermelon - Strawberry - Pineapple - Carrot - Corn - Kiwi Lightweight, Eco-friendly Bags that Scrunch Down into the Attached Fruit/Veggie Pod for Easy Storage Handy, Convenient Bag Sizes are 15in. x 15in. Each Bag - Not Counting the Handles Area. Each Bag Holds Up to 20 lbs Per Bag. Strong, Tough, Durable Nylon Polyester that is Machine Washable - 100% MONEY-BACK SATISFACTION GUARANTEE! !